The bulk of the harvest is still a ways off, but the Scappoose Indians were able to enjoy the first fruits of their labor in a game against Astoria last week. The Indians stunned the visiting Fishermen with a second-half comeback, pulling off their first win under new coach Matt Humphreys. "It's huge for our kids," Humphreys said. "I was just really happy they hung in there and did it. All the credit to them." It was the Indians' second game of the 2018-19 season. They'd lost 90-35 at Valley Catholic on Nov. 28. "I don't even want to talk about that one," Scappoose's Connor McNabb said. The Indians fell to 1-2 with a 70-13 loss at No. 2-ranked (Class 4A) Banks on Tuesday, but the victory over Astoria remained something to build on as they adapt to their new coach's system as well as some individual position changes. Football star McNabb, for example, has moved from being an undersized post position player to running the offense. "Connor has never played point guard, but he came up to me early this year and said 'I'll do whatever you want,'" Humphreys said. "He's willing to take on any challenge, and that's what I love about him. He's a super-competitive kid." Around McNabb, the Indians have a bunch of battlers, scrappers, grinders and football players who will at least make their physical presence felt on the hardwood. "We've got a ton of football players, and they're really tough kids," Humphreys says. "They're bringing that to the court. "Sometimes they foul a little more than I want them to, but they're playing tough." That toughness — physically and mentally — enabled the Indians to pull through against Astoria. Patience was a virtue as well in the Dec. 7 game. Astoria led 15-7 after one quarter and 25-17 at the half. In the halftime locker room, Humphreys told his team to keep the faith. "Coach stressed to us that 'you guys look like the game's over, but we're only down eight points, and that's just four shots,'" said senior guard Ian Johnson. Things didn't look good for the Indians in the third quarter, either. The Fishermen seemed to be cruising. Late in the quarter, they were on top 36-22. At that point, it would have been easy for Scappoose to start looking at the clock and try to make up ground as fast as possible. But Humphreys wanted them to stay focused on running the offense, to play under control and chip away calmly at the deficit. "He wanted us to take our time on offense, getting the shot we wanted and not forcing it," Johnson said. Scappoose scored the final five points of the third quarter on senior guard Gavin Potwin's three-point play and an inside basket by reserve junior post Terrence Lewis after he rebounded his own miss from 3-point distance. Then came a big surge, which started on the initial possession of the fourth quarter and turned the game around. First, sophomore post Bobby Vanek scored from close range. Moments later, Lewis did so as well to cut the gap to 36-31. Then the Indians found the target from outside. Potwin nailed a 3 at the 6:10 mark. After two free throws by Astoria for a 38-34 lead, Vanek scored inside, and then senior sub guard Jaden Holmason caught fire. Holmason drained a 3-pointer off a feed from McNabb — giving Scappoose its first lead. Holmason then jumped in the passing lane for a steal and went in for a layup and a 41-38 lead. Astoria came back with two free throws to pull within 41-40 with 2:07 remaining. But 11 seconds later, Holmason flung another 3 through the hoop. "I just got some open looks, and they went in," he said. "They gave me a little too much space." A steal by Lewis forced Astoria to begin fouling intentionally, and the Indians converted enough at the foul line and stayed tough enough on defense down the stretch to secure the win. "I was really proud of the boys for staying patient," Humphreys said. "I was afraid that when we got down we were going to start playing quick. We needed to take quality shots. I think they're starting to believe that." Vanek came off the bench for 11 points, going 5 of 5 from the field. McNabb scored 10 points, and Holmason wound up with nine. "All the boys were making big-time shots," McNabb said. "I was just there. It was really exciting. The second group came in and played well, and we played a lot better defense, shut down the middle." Gavin Larson, a 6-6 senior starting post, grabbed nine rebounds. "The second half, we tried to slow the game down and play our game," Holmason said. "It was a lot better team-wise than our first game. We had a lot better rebounding, fewer turnovers and better chemistry all the way around." The Indians have seven more games (all against 4A or 3A schools) before they begin their first year in the 5A Northwest Oregon Conference. The Indians were especially happy to win against an old rival like Astoria, one of their former adversaries in the 4A Cowapa League. "It's always good to get a Cowapa League win," McNabb said. 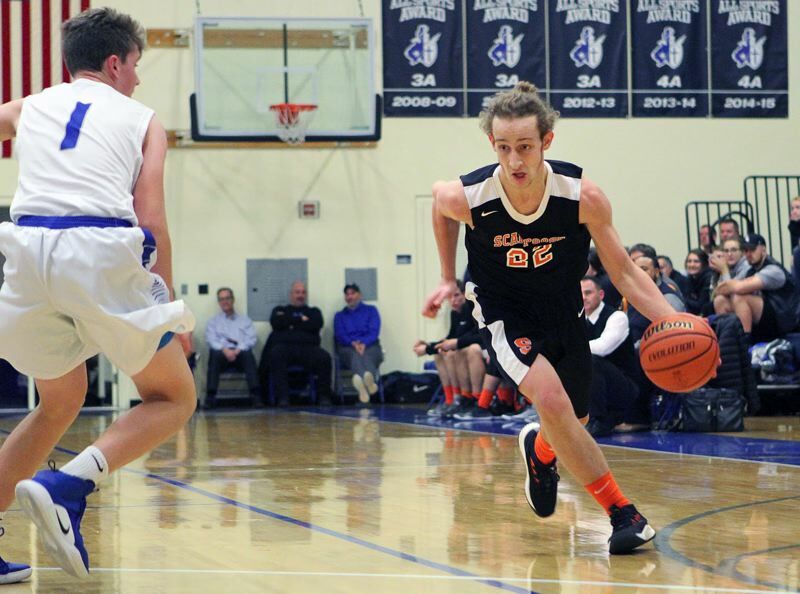 It was Scappoose's fourth boys basketball victory in a row against the Fishermen. "We'll always be in the Cowapa League in our hearts," Johnson added. "We've had a good rivalry with Astoria, so it's good to get a win against them, especially a comeback win before the home fans." Humphreys says he took over this year with "no expectations" for the team but with one main goal: "To establish a culture for all the kids coming up in the program. We've got nine great seniors who are buying in. I'm really proud of them."